With over 45 years of manufacturing experience, Cannon Safe is one of the oldest and most respected safe makers in North America. The USA based manufacturer promotes from within– that’s why all the company’s top brass are dedicated, security pros that have been with the Cannon family for decades. The company has one of the best safe warranty programs around: a lifetime warranty that earns you the right to a no-cost repair or replacement if you are ever unlucky enough to experience a flood, burglary or a fire. Most other safe manufacturers only offer 1 year limited warranties on their safes. Cannon safes truly shine when it comes to security. All Cannon safes feature anti-prying systems, automatic bolt lockers, double steel doors and internal hinges. Also, each Cannon safe has 3 layers of protective steel around the lock mechanism. Cannon specializes in making large, high quality safes– and the CA23 is no exception to the rule. It’s standout security feature is probably its extra thick doors. They are more than twice as thick as the standard safe door and extremely hard to penetrate using standard safe cracking tools. The second best thing about this safe is probably its lifetime warranty. If fire, flooding or burglary results in safe damage, Cannon will set you up with a new one for free. Extremely thick door. This safe’s 4 inch thick steel composite door will repel any crook who tries to drill his way to your most valuable possessions. Plenty of interior space. With enough room for 24 guns, this safe gives you lots of room to store your weapon collection. Resists extreme heat. Unlike some safes that can only last 45 minutes in a fire, with Cannon you get 60 minutes of fire protection. Active lock bolts. If the safe detects that its being broken into, the active lock bolts instantly slam shut. Stylish 5 spoke handle. 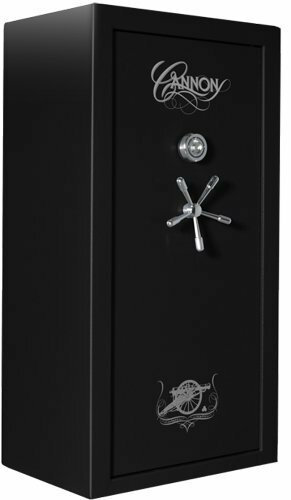 This safe’s elegant fixtures lend it a classy, upscale look. Accessories are available. If you have pistols that you want to store away with your long gun collection, pick up the door panel pistol kit. Lifetime warranty. As with all Cannon safes, this one comes with a lifetime warranty against theft, flooding and fire. Some Cannon safes come with a RJ45 built-in internet connection, but unfortunately this particular model does not. Measuring in at 57 1/4 inches tall, 38 1/2 inches wide and 18 3/4 inches deep, Cannon’s 48 gun safe is designed for firearms enthusiasts that need to store large amounts of guns. It’s 4 inch thick door provides a massive barrier between your prized possessions and any thief who would like to steal them. Perhaps best of all, if your safe ever gets damaged by a burglar, a fire or a flood, Cannon will send you a new one free of charge. Massive, nearly impenetrable door. This 4 inch thick door provides a great defense against drilling attacks. Lots of room inside. With enough room for 48 guns, you get enough space to store an entire militia’s worth of weapons. Defend against fire. This safe can withstand 30 minutes of intense heat. Tamper lock active bolts. If the thief somehow manages to rip out the lock, the bolts will slam shut automatically. Classic Cannon design. This safe’s subtle but elegant appearance will improve the look of any room in your house. It’s a “smart” safe. This safe’s RJ45 connection allows you to hook it up to the internet. The best warranty in the industry. 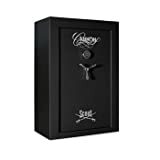 As with all Cannon security products, with this safe you get a a lifetime warranty against theft, fire, and flooding. 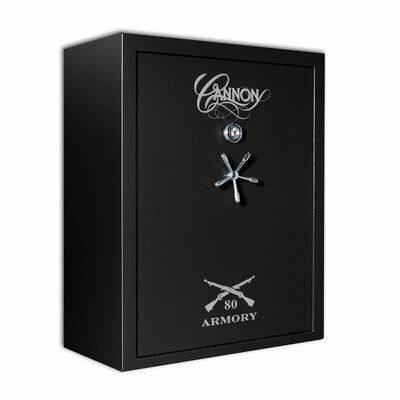 This safe is not as fire resistant as other Cannon safes, which can withstand 60 minutes of extreme heat. Looking for a truly massive gun safe? Look no further. This 80 gun safe from Cannon stands 59 inches tall, 48 inches wide and 30 inches deep. It’s one of the largest gun safes we’ve encountered– and it’s also one of the most secure. It’s got a heavy duty 4 inch thick door and tons of room inside for a very large collection of weapons. 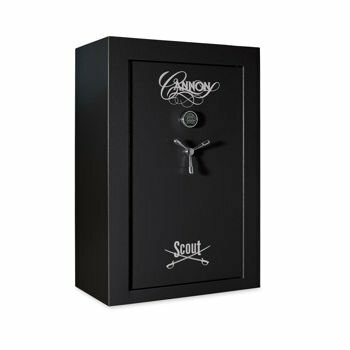 This safe isn’t cheap, but Cannon will send you a new one free of charge if it ever gets damaged due to fire, flooding or burglary. The door is very thick. This safe’s ultra heavy duty 4 inch thick door is one of its best security features. EMP proof. The lock is electronic, but its wires are shielded against EMP (Electro Magnetic Pulse) attacks. Interior lining. The carpeted interior prevents you from accidentally scratching up your safe or your guns. It’s as heavy as an elephant. Weighing in at 799 pounds, there’s simply no easy way to carry this safe away and crack it open later. Interior lighting. This key feature allows you to see what you’re doing if you ever need to access your guns in the dark. Connects to the internet. You can link this “smart” safe to the web via one of its two RJ45 ethernet jacks. Lifetime Cannon warranty. If this safe is ever damaged from fire, flooding or theft, you get a new one for free. A safe as large and as expensive as this one should be water resistant– but it’s not.